Starting a new job can be both stressful and exhilarating. The people are different, the location is strange and the way they work is peculiar to that enterprise. There may be a seven-level procurement organisation chart or a loose, undocumented reporting structure to be navigated. What is also daunting is the 'in-speak': specific terminology which may be like a foreign language to you. So, what do they mean? An operating model is the way in which the procurement function is set up to work. 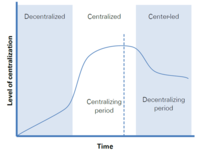 Most companies start out being decentralised, unstructured and even disorganised until the workload grows. As the functions expand and mature, there needs to be some form of formalising and centralising activities to consolidate spend. Only then can we expect to achieve savings and reduce risk exposure. Centralised procurement does have its benefits. It means more control over suppliers and contracts as well as helps to drive supplier diversity and corporate social responsibility (CSR) initiatives. Risk is mitigated and skills development is made easier, expanding capabilities. However, it can become a very bureaucratic and expensive cost centre. Too much data and not enough information can result in a loss of focus and lead to poor stakeholder service. People at the centre do not always understand regional and local supply markets or consumption patterns. If 'central' means the US and the region is Papua New Guinea, there may be cultural challenges too. As procurement organisations move on and mature, over time, many of them become centre-led, taking some time to decentralise personnel and day-to-day operations. Wherever your organisation is on this curve, it is helpful to know what it means to be where. There is no one best structure. The way your organisation works is influenced by the external supply market, end-user needs and overall company strategy. You just have to ride the wave! Centre-led procurement organisations concentrate on defining strategy and policy for both their direct and indirect procurement. Corporate spend can be fully leveraged on strategic commodities and services which are well-suited to centralised sourcing. Non-strategic categories not suited to centralised sourcing can be handled by the individual business units or regions. Centre-led procurement uses a category management structure which supports the rollout of sourcing and contracting plans to business unit and regional levels. This type of set-up is often called a 'hybrid model'. Category management refers to the bundling of third-party spend into buckets to extract more value. The main aim behind category management is to aggregate internal demand and achieve economies of scale by contracting the best suppliers at the lowest price. In its best form, it involves an active category manager that rolls out category plans, strategic sourcing and supplier management initiatives. In a centre-led organisation, a global category manager would set the strategy for the category group, e.g. transport logistics, as well as for the sub-categories (sometimes called 'commodities') within that group: road, rail and air transport; freight forwarding; port activities; and courier services. At regional or divisional level, category plans are followed and executed locally to achieve the best results for an organisation. This is the ideal but it is rarely implemented in full. Some categories are really challenging: marketing services, technology and professional fees come to mind. To be effective, a category needs to be managed using one or more cross-functional teams (CFTs). A CFT comprises representatives of key divisions and business units that work together, with procurement, to achieve the best results for the organisation in that category or commodity. Although extensively used in strategic sourcing, CFTs are being used increasingly and successfully across process improvement, product development, quality assurance and the assessment of suppliers. The benefits are well-documented: a more robust outcome, transfer of skills and learnings, improved internal co-operation and sustainable relationships. Global organisations that run virtual CFTs have special challenges. With the application of innovative methods and up-to-date online technology, it is now easier and more effective. Stakeholders are capable of influencing the success or failure of a project. As a procurement organisation matures, it is likely that executives will revise and adjust a hybrid or centre-led structure so that it remains aligned to corporate objectives and continues to deliver value. The best model is always the one that delivers results through open lines of two-way communication and uses processes that are flexible enough to take into account regional and cultural differences.